This volume examines the role of the military, the most influential actor in Pakistan, and challenges conventional wisdom on the causes of political instability in this geographically important nuclear state. It rejects views that ethnic and religious cleavages and perceived economic or political mismanagement by civilian governments triggers military intervention in Pakistan. The study argues instead that the military intervenes to remove civilian governments where the latter are perceived to be undermining the military’s institutional interests. Mazhar Aziz shows that the Pakistani military has become a parallel state, and given the extent of its influence, will continue to define the nature of governance within the polity. 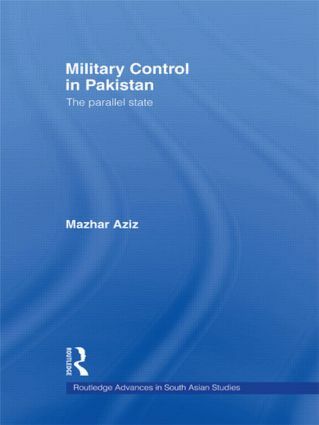 Overall, Military Control in Pakistan is a timely reminder and an important resource for both scholars and policy makers, clearly demonstrating the need to refocus attention on the problem of an influential military whilst drawing appropriate conclusions about issues ranging from democratic norms, political representation and civilian-military relations.